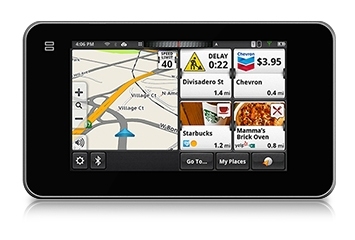 One of my top picks for the holidays is this awesomely updated version of a GPS from Magellan. While it seems that many standard GPS systems are just not up to speed anymore, don’t update as they should, etc., it sometimes feels outdated to use a GPS as opposed to using features on your smart phone. But, I don’t like to use my phone while I am driving as I personally feel distracted. We received a Magellan SmartGPS to check out and I was anxious to see how it compared to old-school GPS systems. With the new Magellan SmartGPS, I don’t have an issue. It has combined all the great features of your smartphone with the traditional GPS to create a mega GPS that does oh-so-much more than a standard GPS! Using your phone and a corresponding SmartGPS app, you can sync your information to the GPS to be displayed on your dashboard via the screen (which is the perfect size). This GPS will get you where you need to go, which is the whole point of a GPS, however, I think the extra features are what make it extraordinary and a great gift for the holidays. Let’s say I am driving in an area that I am not familiar with. As I drive using the map on the left section of the screen, pictures will pop up of landmarks on the right hand side of the screen. This could be restaurants, shopping, or gas stations and yelp reviews and ratings will pop up to tell me about those spots. This is so helpful, especially when traveling, to see reviews of local restaurants right at my fingertips. Need gas? No problem–this GPS will pop up the best gas prices locally to help me save money on a fill up. How cool is that? When on my way to a destination, it will also alert me to red light cameras, accidents, and other traffic alerts to save me time and frustration. It’s like having someone tell you the best way to go, best places to visit, and how to avoid hassle right in my car! The screen is easy to navigate and read, very intuitive. See how easy it is to work in this video. I love this GPS and feel that for the price point and the features offered in the SmartGPS, you are getting an incredible deal. You can pick up your own for the holidays at major retailers everywhere or online.